Finally, it’s the summer holidays and this usually means I have plenty of reading time. However, this summer I am determined to devote some time and energy to resting with my family. Rest assured, I will still be reading but our holiday plans mean I will not post individual reviews over the next few weeks. I’ll aim to complete a round-up of my summer reading instead. Happy reading, wherever you are! Thank you NetGalley for granting me access to this prior to publication. A chilling tale of what might yet come to pass. In our future climate change has reached what might be seen as an inevitable conclusion. Parts of the world are inhospitable. The world’s population is moving northwards and, inevitably, some react better to this than others. 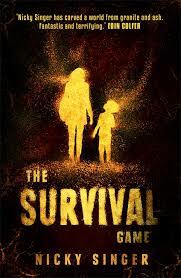 We follow 14-year old Mhairi as she escapes the detention centre she’s placed in after travelling illegally from Cairo following the death of her parents. She is determined to walk to Arran, the home of her grandmother. Along the way she reveals snippets of her story which it might be easy to miss as they’re quite understated. These snippets build a truly terrifying picture of this new reality. Once she – and a young boy she saves en route – make their way to Arran it would be lovely to think their story was over. Far from it. In fact, it’s once they arrive with Mhairi’s grandmother that the difficult questions start. Some very difficult questions raised in this, and the ending of the novel rather took my breath away. 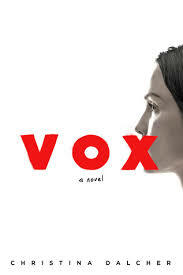 ‘Vox’ is being heralded as ‘The Handmaid’s Tale’ for a new generation. If that’s the push people need to pick this up then so be it., as this is a book that really should be read. By everyone. Dr Jean McLellan is an eminent neuroscientist. She has her personal flaws but in her career she was at the forefront of studies into the brain and how it’s impacted by illness. I use the past tense because when we meet Dr Jean her role has been drastically reduced, like that of many women. In this America women are no longer part of the work force. Their role is to nurture children and keep the home. Their rights have – as we learn in bits and pieces – been eradicated. This alone was enough to anger me, but the fact their voices are taken away was jaw-dropping. Each female wears a wrist counter. It allows them 100 words a day. 100! The fact that nobody openly questions this tells us just how different things are in this imagined world. The premise of this story was absorbing. I particularly liked the way we learn how such a situation came into being. Like so many periods in history where such things happen it’s always easy to look on in hindsight and question the actions of those alive at the time. Sadly, Dalcher paints all too vivid a picture of how this came to pass. The story was chilling as we come to understand just what is at risk here. A timely reminder of the need to question decisions made by those in power. Thank you NetGalley for granting me access to this prior to publication.